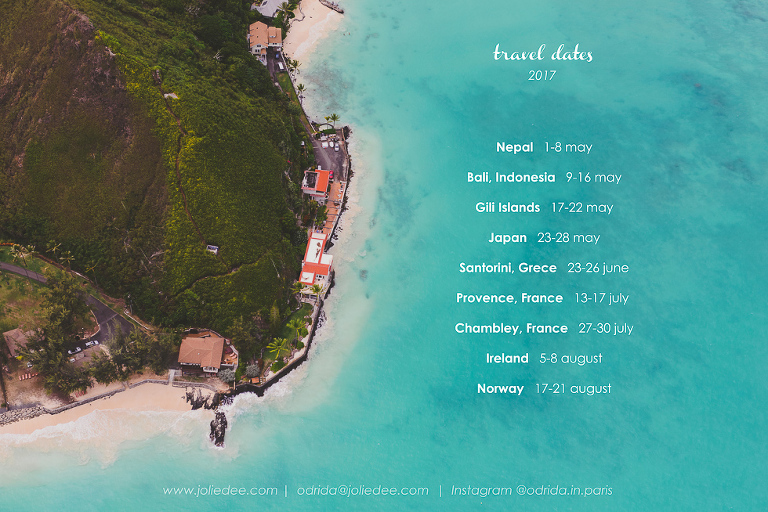 Travel dates 2017 – It’s going to be a wonderful year! You all know how much I love to travel 🙂 I am so excited that this year I will visit some extraordinary destinations and that I can finally share with you my travel dates! I will go to some of them mainly to relax and enjoy but I will be available for photo sessions everywhere. Nepal was definitely a must for us. After a few days to explore the sights of Katmandu, we will start a circuit of Anapurna mountain. We have already started training for this trip. Actually, the circuit itself is not so hard to do, but sleeping in the mountains in low temperature and climbing and walking 7 hours per day will be probably challenging. I am looking forward to any kind of photo sessions in Indonesia. If you are interested, just use the contact form. I am so excited to see the places I have been dreaming about for a long time – Tokyo, Kyoto, Mount Fuji and famous lush and sophisticated gardens of Japan! I always wanted to do a photo session in Oia, Santorini, and I’m so happy to have a chance to photograph a beautiful couple there in June. I am still available for other photo sessions there. Sure, it will be amazing! Lavender Fields are some of my favorite places to photograph. I go there every year for photo sessions and I am not going to miss them this year either.Get into the wedding dress of your dreams or a summer dress which makes you look your best, and let yourself enjoy in a shoot. This is a fantastic place to capture all the beauty and joy! Check my latest photo session in Provence here. Chambley is one of the loveliest sceneries for a photo shooting. Photos I took there two years ago still inspire me and I always want to travel back there. Every two years, there are air balloon contests there and I don’t want to miss a chance to fly among so many balloons and experience unique sensations. If you are planning your engagement shoot in a special and creative place, that’s the one!!! This summer, I will photograph a wedding in Ireland. It makes me so thrill and happy to have a chance to capture mysterious castles and magnificent mountains in the background. I keep counting the days until my trip to this lovely country. If you would like a photo session, I am available on August 6 and 7. I wil travel to Norway this year, for the first time. I am so excited and I guess I will come back with some great photos! Cannot wait! If you want to book a photo session in any of these countries let me know!